The Dutch dog magazine Onze Hond published a nice long article about our Barbet( September issue). Lovely photos of shades of Barbet, taken at von der Leibrücke Kennel,black (with white) brown (with white) and the white with black, much rarer, but keep in mind that is the continuation of the black and white pattern. Courtesy: Les couleurs de robes chez le chien. Royal Canin. Written by Pr Bernard Denis. This is our new website, devoted to our beloved breed: the Barbet. I, personally am extremely proud to be able to announce this event here. We believe the Authentic Barbet exists and we will do everything in our power to keep it the way it looked when the standard was written, in 1891, to be able to transmit it to the next generations. The Barbet:Our French National Treasure. I hope you enjoy it. Thank you Paula and Tracey, you did a heck of a job building the site! (Run your curser over the key words on the side, you'll see a photo each time). Left front: French and sister Floirac ( Bijou and Compay II); in the back Thelma, Bijou's mom and standing Coccolina, Compay's mom. Not many breeders can claim maternal and paternal grand-mas under one roof. I can ! Those of who who sent their enrollment form in months and months ago for 2010, you should be receiving it. If you don't, contact the club. I will put the dates to remember under ABC, so you can find them. I have been asked to ask you to come to the club specialty show in June in Lyon. The day after the Club specialty show, is the Lyon CACIB show. The judge is a competent one who likes the Barbet (which is not the case for some). Becoming French Champion is not a matter ( most of the time) of being there and accumulating points and voilà, you're champion. The club website has all that info. Last but not least, some photos have fallen off my issue of the club bulletin. If anyone has them, I'd like to fill in the blanks! Thank you! Even if they appear to be...they ain't. hum...they do their homework very well. Don't thse coats remind you of something? I knew I had something profound about the above situation: In French and in English. Le Labradoodle n’est pas une race traditionnelle, il a été fabriqué de toute pièce il y a une trentaine d’années en coisant un labrador avec un caniche, d’où le nom de labardoodle, le caniche étant appelé poodle en anglais. Le plus fort, c’est que le labradoodle a été reconnu officiellement par la société canine australienne. Le standard reconnaît 3 tailles, grand, moyen et miniature et deux types de poil, frisé et ondulé. 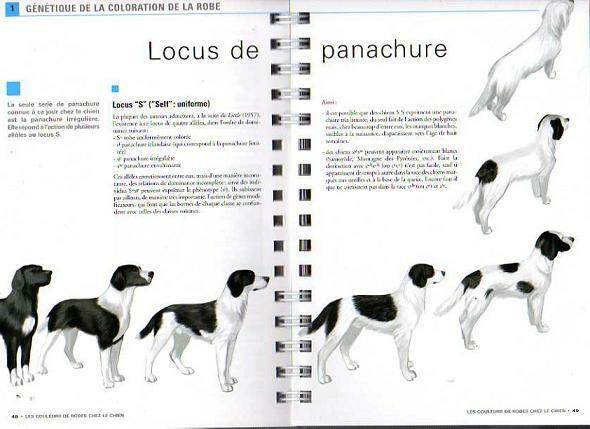 L’ensemble du cheptel est très disparate, certains sujets ressemblent à des caniches, d’autres à des bâtards d’on ne sait quoi. Après le mélange initial, les australiens on rajouté de l’Irish water spaniel, du retriever, du cocker anglais et du cocker américain. On se demande ce que les australiens vont pouvoir inventer maintenant ? pourquoi pas le pointeroodle ou le bobtailoodle, tout est envisageable. 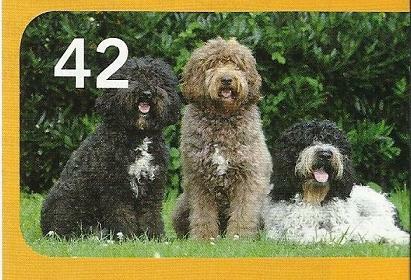 "The labradoodle is not a traditional breed, it was completely fabricated from scratch about 30 years ago by crossing a poodle and a labrador which gave the name labradoodle, the caniche was called poodle in English. What is really amazing is that the Labradoodle has officially been recognized by the Australian Canine Federation(? Society?). 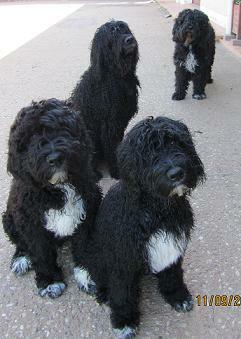 There are 3 sizes in the standard: big, medium and miniature and 2 types of coat: curly and wavy. The whole of its population is completely ill-assorted, some looking like poodles, others like griffons, and others like bastards that we have no clue where they come from. After the original ‘mix” the Australians added a dose of IWS, curly coated retriever, English cocker and American cocker. One would wonder what the Australiens are going to invent next? Why not the pointerpoodle, the bobtailoodle...the sky is the limit!